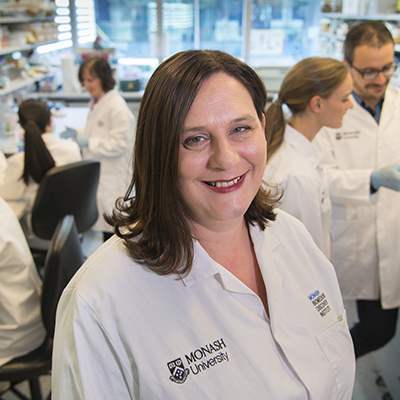 Monash Biomedicine Discovery Institute (BDI) group leader, Associate Professor Helen Abud is lead investigator on a grant funded by Cancer Australia to test how ‘organoids’ grown in a laboratory environment can be used to predict patient responses to therapy. These findings aim to develop a pre-clinical test that could be used by oncologists to inform patient treatment. Announced by The Hon. Greg Hunt MP, Associate Professor Abud and other research partners from the Australian Living Organoid Alliance received almost $600,000 in funding from the Priority- driven Collaborative Cancer Research Scheme (PdCCRS). Established in 2007 by Cancer Australia, the PdCCRS is an annual funding scheme created to support research that reduces the impact of cancer on the community and improves outcomes for people affected by cancer. In collaboration with Associate Professor Paul McMurrick from Cabrini Hospital, Associate Professor Abud’s laboratory studies human bowel cancer organoids isolated directly from patients. This funding will allow this work to continue in a collaborative fashion with researchers and clinicians from different sites in Australia. Colorectal cancer is common throughout Australia, with a high mortality rate. The Cancer Genome Atlas and other research projects have catalogued many of the genetic and epigenetic markers of colorectal carcinogenesis. Yet these incredible resources cannot experimentally validate therapeutic targets. There is the need for a living, preclinical ‘bridge’ to understand the evolution of cancer and to discover new susceptibilities. One such biological bridge is the development of organoid-based technology. Following a diagnosis of bowel cancer, small amounts of both normal and cancerous tissue (both primary and metastatic) are taken from the colon of bowel cancer patients to establish organoids. Organoids are easily propagated while remaining biologically representative of the original tumour from which they are taken. They can be screened for drug sensitivities, and potentially used to guide patient therapy. While organoid technology holds great promise, currently the clinical relevance to guide patient care is unknown. To address this shortfall a series of innovative experiments will be conducted to establish if, and how, organoids could be applied in the clinical management of patients with bowel cancer. “As organoids maintain properties seen in the patient tumour from which they are derived, they can be used to test individual sensitivities to drugs,” Associate Professor Abud said. The research team has grown organoid cultures from all the different stages of colorectal cancer including metastatic tumours or secondary tumours where bowel cancer has spread to a different part of the body. “This enormous resource will help determine drug sensitivities in all the different types of bowel cancer,” Associate Professor Abud said. The assessment process for the 2017 PdCCRS grants was done in collaboration with the National Health and Medical Research Centre. Cancer Australia’s PdCCRS has provided $124 million for cancer research since its inception in 2007. Click here for the full list of PdCCRS grant recipients.